North Macedonia was spared the inter-ethnic violence that raged elsewhere in the Balkans following the break-up of Yugoslavia in the early 1990s, but came close to civil war a decade after independence. Rebels staged an uprising in early 2001, demanding greater rights for the ethnic-Albanian minority. After months of skirmishes, EU and Nato support enabled the authorities to strike a peace deal. Albanian fighters laid down their arms in return for greater minority representation. International recognition of the country's split from Yugoslavia in 1991 was held up over Greek fears that its name implied territorial ambitions toward the northern Greek region of Macedonia. In 2018 the then Republic of Macedonia and Greece agreed on a new name - the Republic of North Macedonia - which came into force in February 2019. Professor Gjorgje Ivanov was sworn in as the fourth democratically-elected president on 12 May 2009. He was re-elected in April 2014. Although he was put forward as a presidential candidate by the governing VMRO-DPMNE party, he is not a member. His predecessor, Social Democrat Branko Crvenkovski, won praise in the West for supporting reconciliation with the substantial Albanian minority. North Macedonia's presidents are directly elected for a five-year term. The president appoints the prime minister, and legislative power is vested in parliament. Social Democrat leader Zoran Zaev and his coalition partners representing North Macedonia's ethnic-Albanian minority formed a government in May 2017, ending a lengthy political deadlock. Until he was given written guarantees, President Gjorge Ivanov delayed approving the coalition for fear that empowering the large Albanian minority could threaten national unity. The country had been without a functioning government since 2015, when it fell into turmoil over a wiretapping scandal that brought down the nationalist VMRO-DPMNE party. Television is North Macedonia's most popular news medium. Public networks face stiff competition from commercial stations, which dominate the ratings. 1913 - Ottoman rule in Europe ends after five centuries. 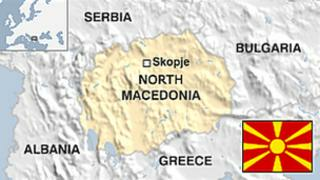 Historic Macedonia is partitioned between Serbia, Bulgaria and Greece. What is now North Macedonia is incorporated into Serbia. 1914 - First World War. Macedonia is occupied by Bulgaria. 1918-19 - Macedonia becomes part of Serbia again. The Kingdom of Serbs, Croats and Slovenes is founded, and is renamed Yugoslavia in 1929. 1945 - Establishment of Yugoslav socialist federation, comprising six republics, including Macedonia. 1980s - Rise of nationalism among federation's constituent republics. 1991 - Declaration of independence. International recognition is slow because Greece objects to the use of the name Macedonia, the same as one of its own provinces. 2001 - Uprising by ethnic Albanians. Rebel militia engages in skirmishes which bring country to brink of civil war. Peace deal involves greater recognition of Albanian rights in exchange for rebel pledge to lay down arms. 2019 February- Name change to North Macedonia comes into force, opening the way for Greece to stop blocking the country's bid to join EU and Nato.